For a child with arthritis or a related condition, lack of knowledge on the part of the parents is one of the biggest obstacles to recovery. Parents do not always know how to interpret the complaints voiced by their children and this is compounded by the inexperience of physicians, who rarely treat children with these ailments. In this marvelously down-to-earth guide, Dr. Thomas Lehman the head of one of the leading pediatric rheumatology programs in the world offers a gold mine of expert advice that is invaluable both for parents whose children have rheumatic disorders and for parents of children with complaints, discomfort, or disability who are not getting the answers they need from their physician. Using simple analogies and illustrative anecdotes to illuminate hard-to-grasp concepts, Dr. Lehman helps parents interpret their child's complaints and to determine whether medical attention is needed. Even more important, the book explains to parents how to follow through with a physician and make sure their child receives the appropriate tests, the proper diagnosis, and ultimately, the best care possible. The book explains to parents what symptoms to look for, what questions to ask, and what to expect when treatment begins. 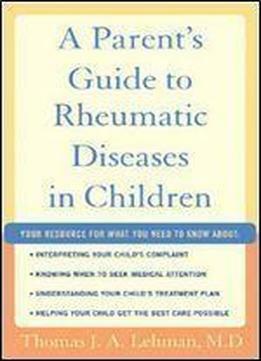 It sheds light on a wide range of rheumatic disorders including Juvenile Arthritis, Lyme Disease, Lupus, Kawasaki Disease, Fibromyalgia, and Chronic Fatigue Syndrome and it addresses such crucial topics as drug safety, the potential risks to children posed by medications, health insurance problems, the difficulty of family life when a child has a chronic disease, and much more. The only book on this subject currently available, A Parent's Guide to Rheumatic Diseases in Children captures the expertise of a dedicated physician with over thirty years of hands-on experience helping children lead normal happy lives. It will help you to ensure that your child achieves the best possible outcome.